The word Titanic means having a great magnitude, force, or power and for a brief moment, it really was. Great fascination has been placed by many for a century now over the once called "unsinkable" ship that is Titanic. I, for one is very guilty of this. This so called enchantment with the Titanic has rubbed off tremendously on my children. We watched the movie together, read the books, and looked at hundreds of pictures on the internet. Now, imagine my excitement when I learned about the Titanic: The Artifact Exhibition - currently running at the San Diego Natural History Museum at Balboa Park until September 9, 2012 - from my dear cousin in San Diego. I was beyond ecstatic! It would be a rare opportunity and a fulfillment of my (and my kids) Titanic dream (metaphorically speaking)! I want!!! But, as fate and economics would have it, I don't see that happening soon. *stomping feet* My cousin went to see the exhibit though and told me what she saw as I enviously listened. The exhibition features room re-creations such as the first and third class cabins and some 200 different artifacts gathered from the wreckage site itself that includes chinawares, spoons, jars, cups, toothpaste caps, and ballpens among other things. 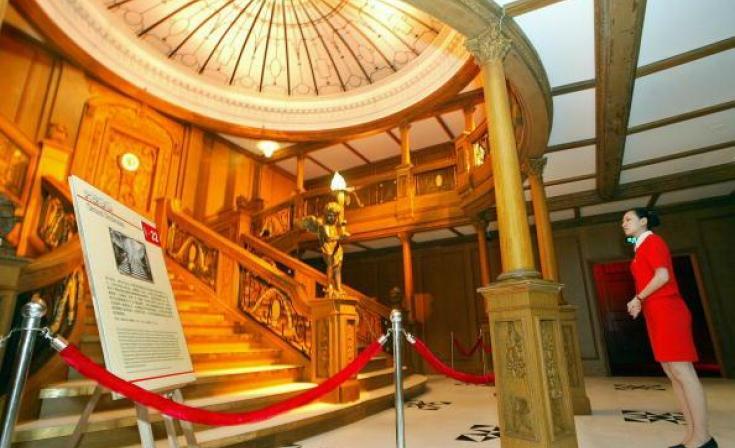 Of course, no Titanic exhibit would be complete without a replica of the famous Grand Staircase where Jack stood as he waited for Rose to arrive in that James Cameron gazillion dollar blockbuster hit. There's even a big chunk of an iceberg replica where the visitors can touch so as to have a good idea of the chilling temperature of that April 15, 1912 night. Below are some of the pictures taken from the exhibition. The Titanic: The Artifact Exhibition is an "Educational, emotional, and appropriate for all ages" experience as stated on the San Diego Natural History Museum website. Visitors will have the chance to learn about the different stories of the passengers through the artifacts presented. They can also get a great peek at how grandiose, lavish, and masterfully done the interiors of the Titanic were. This exhibition is not exclusive to the city of San Diego. There are also exhibitions of the same kind in Las Vegas, Atlanta, Orlando, Kansas City, Detroit, Houston, and Singapore. For those who have the capability (in all aspects) to visit the The Titanic: The Artifact Exhibition, please do so. Again, it is a rare opportunity to walk-through parts of one of the most magnificent ships in history, learn about this great maritime disaster, and pay tribute to all those who have perished.